The (perfectly valid) scientific background to the story is a search in the Daintree rainforest for a botanical cure for the affliction known locally as the Daintree ulcer or Mossman ulcer. It is a nasty flesh-eating ulcer with no known prevention or cure, caused by a bug (Mycobacterium ulcerans) related to those which cause leprosy and tuberculosis. It is globally rare but is locally problematic in Africa, where it is known as the Buruli ulcer, and in China, Japan and other tropical countries. Here in Australia it occurs in coastal areas of the Wet Tropics and (oddly) Victoria. We still don’t know where in the environment it lurks or how it infects people but there are suggestions that it may jump to humans from other mammals (in Australia, perhaps possums) via insect bites. Its incidence in Victoria nearly tripled from 2015-17 according to the Victorian Health Dept (see the “Notifiable infections” link on this page ) but again, we don’t know why. That’s rather more medical science, if you follow the links, than you will find in the novel but this blog does have a tropical wildlife emphasis. Back to the book! Commercial control of natural resources and traditional knowledge can be hotly contested. Common sense suggests that people own their knowledge and own the crops and medicines they grow, but big business tends to ignore common sense and claim ownership – and, consequently, control and profits – whenever and wherever it can get away with doing so. For an overview of the issues, try this page. Oops! Back to the book again! 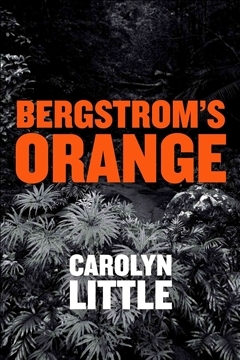 The Bergstrom of the title is a bioprospector, a Swedish medical scientist searching the Daintree rainforest for a cure for the Buruli Ulcer which he saw in Africa. He has good intentions but, unfortunately for him, others are have the same idea but are in it for the money and don’t care who gets hurt. When he goes missing his friend, local tourist guide Jason McNeil, initiates and supplements the police enquiries. This is Carolyn Little’s first novel and she brings to it a good knowledge of the science, both medical and botanical, and the local area. If it lacks a little polish, this reader, at least, is happy to forgive that for the sake of an unusual, topical (and tropical) story line. The author’s home page is, unusually, a Facebook page. Goodreads’ page on the book may be more convenient, as it links to ebook and online hard copy retailers. Not enough is being done about a “serious epidemic” of gruesome flesh-eating ulcers that have affected hundreds of people in parts of regional Victoria, health experts have warned. In today’s Medical Journal of Australia, infectious diseases expert Daniel O’Brien writes that cases of the Buruli ulcer are on the rise and urgent government funding is needed combat it.